In February of 2016, the government of The Bahamas took a critical next step in supporting the development of a broader oil and gas industry in the country when it passed into law a revised Petroleum Act and a Sovereign Wealth Act. Minister of the Environment Kenred Dorsett said the bills, along with accompanying regulations, address the “reformation and transformation of the upstream petroleum sector” and created what he termed a “modern, well-defined industry,” with legislation benchmarked against international standards. Dorsett has previously been vocally supportive of such an industry being established, stating that an oil strike would be “economically transformative.” The original legal framework pertaining to oil and gas exploration in The Bahamas dates back to the 1970s, and the updating of the legislation represents the most concrete demonstration of the government’s support for further progress in this sector and is being viewed by some as a boon to potential investors. During debate over the bills, Dorsett said they will now contribute to “the framework on which The Bahamas of the next century will be built.” The legislation’s passage in both the lower and upper chambers of Parliament and its subsequent implementation on March 31, 2016, comes after several years of groundwork by the government and removes an existing obstacle to the further development of the sector in The Bahamas–a lack of clearly defined and modern regulations that provided desired certainty for oil and gas investors about the environment they will be operating in and what will be expected of them and the government. The Petroleum Act encompasses several elements: governance regulations and institutional framework; the legal, licensing and contractual framework; the fiscal and commercial framework; and the health, safety and environmental framework. In addition to the package of petroleum legislation, a Sovereign Wealth Act was enacted to assist in allowing for excess wealth accrued by the government from successful exploration and discovery development to be better invested, managed and conserved for the long-term benefit of the country. The government worked along with its international lawyers, Hogan and Lovells, the Ocean Governance and Natural Resource Management Section of the Commonwealth Secretariat to develop the legislation and accompanying regulations, benchmarking it against legislation in 33 jurisdictions globally. A study by the Commonwealth Secretariat supported a government decision to provide for it to receive 12.5 per cent up to 75 per cent of profits arising from any oil and gas extraction. As profits increase, the legislation allows for the government’s share of those profits to do so as well. The government is granted the right to negotiate financial terms with any investors, though not to the extent that any arising agreement would contradict prevailing law. Dorsett said the new regime represents a “great balance” between government and investor of oil-related revenues. The minister is given powers to grant permits, exploration licenses and production leases, the first of which gives a non-exclusive right, while the others provide an exclusive right to the holder to explore and develop discoveries. Prohibitions are included on the assignment or transfer of such rights without government authority. The government too, has been given the option under the law to participate in the industry. Provisions are also made for cases where discoveries extend into the boundaries of another country, or beyond the boundaries set out under a license and an obligation is put in place for the submission of an exploration programme to the minister ahead of any drilling activity. The legislative package contains regulations that support more modern, appropriate and up-to-date risk management techniques, safety case methodologies, obligations for environmental management and pollution control systems, emergency procedures and effective safety management. Absolute liability for environmental damage is placed on the holder of the permit or license in question, and requirements are put in place for insurance and to provide certain key information to the government such that it can inspect operations for compliance. The legal compendium was touted by the most likely immediate beneficiary of it, Bahamas Petroleum Co (BPC). The company, registered in the Isle of Man and listed on the London Stock Exchange, has four licenses to explore in the southern Bahamas that run until the second quarter of 2018, including a key obligation to begin an initial exploration well by April 2017. In a March 2016 financial results release, Potter said that the legislation had provided much needed “clarity in a commercial and regulatory sense” for investors, saying its enactment would “more readily enable” BPC to attract a “farm-out partner”–a company with which it can joint-venture financially and strategically in order to fund and execute the “spudding” or commencement of an oil well in the southern Bahamas to test the findings of its studies and confirm if there are commercially-viable quantities of oil within the territorial waters of The Bahamas. 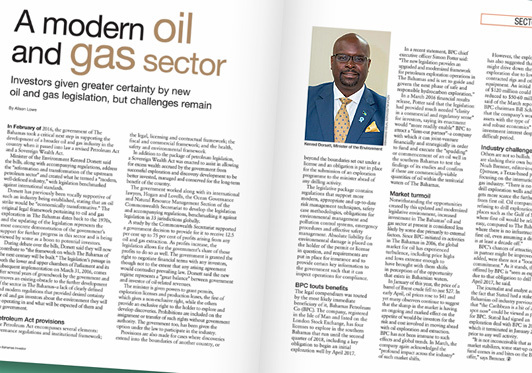 Notwithstanding the opportunities created by this updated and modernized legislative environment, increased investment in The Bahamas’ oil and gas sector at present is considered less likely by some due primarily to external factors. Since BPC initiated its activities in The Bahamas in 2006, the global market for oil has experienced turbulence, including price highs and lows extreme enough to have brought with them shifts in perception of the opportunity that exists in Bahamian waters. In January of this year, the price of a barrel of Brent crude fell to just $27. In early April, oil prices rose to $41 and yet many observers continue to suggest that the slump in the market is having an ongoing and marked effect on the appetite of would-be investors for the risk and cost involved in moving ahead with oil exploration and extraction. BPC has not been immune to such effects and global trends. In March, the company again acknowledged the “profound impact across the industry” of such market shifts. However, the exploration company has also suggested that the effect might drive down the likely cost of exploration due to lower demand for contracted rigs and other necessary equipment. An initial projected cost of $120 million could now be reduced to $50-60 million, Potter said of the March report. Meanwhile, BPC chairman Bill Schrader asserts that the company’s work has revealed assets with the type of “material scale and robust economics” to warrant investment interest despite the difficult period. BPC’s chances of attracting a farm-in partner might be improved, Brenner added, were there not a “looming well commitment.” As it stands, the acreage offered by BPC is “seen as expensive” due to that obligation to drill a well by April 2017, he said. The journalist and analyst added that the fact that Statoil had a stake in the Bahamian oil industry previously and that “the Caribbean is a bit of a hot spot now” could be viewed as positives for BPC. Statoil had signed an exploration deal with BPC in 2009, which it terminated in January 2014 prior to any well activity. “It is not inconceivable that as the oil market stabilizes, some start-up or hedge fund comes in and bites on the BPC offer,” says Brenner.